We flew to Florida for Deanna and Rick's engagement session. They wanted photos done at the St. Augustine Lighthouse and around the town of St. Augustine! This destination engagement was amazing! Deanna and Rick were awesome to photograph. They were up for all of our crazy ideas too! After doing photos at the actual lighthouse, we walked around the rest of the property for a little while. Neal came across these gnarly trees. He used to live in Florida, so this was not the first time he saw these before. They were new to me and I loved them! Great idea for some photos! The branches created natural frames too! There were not many leaves on these trees, but that was ok. We got to see more detail. 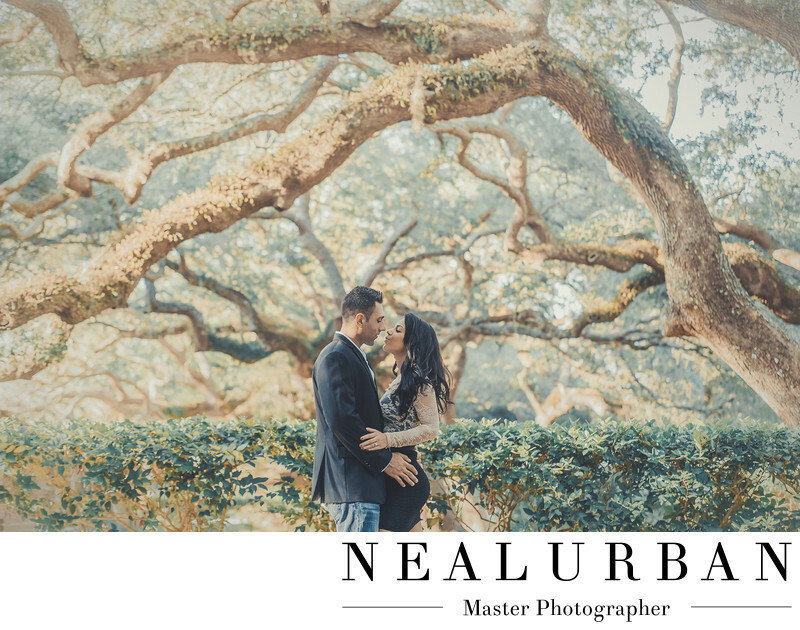 There were low bushes planted in between some of the trees, so we placed the couple in front of that. It gave some great color to the image! The sun light was coming in and lighting up everything. It really looked like a painting behind Rick and Deanna! Their outfits looked really good to with this! Then we headed into St. Augustine for photos around the town at night! The next day we also did beach photos for them! They ended up moving back to the Buffalo area. They had their wedding at Salvatore's Italian Gardens! We took so many more amazing images for them! Location: 81 Lighthouse Ave, St. Augustine, FL 32080.